It's a dream for many players to play at NFL, the highest professional level of American football in the world. Among few, NFL star Michael Oher, who is one time Super Bowl winner, has lived up to his dreams because of his hard work and dedication. The Memphis native grew to become a professional NFL American football offensive tackle just after completing his studies at the University of Mississippi. He was first drafted by the Baltimore Ravens in the first round of the 2009 NFL Draft. On March 14, 2014, Oher signed four years with $20 million contracts with Tennessee Titans and later on March 14, 2014, Oher recieved a 2-year contract with Carolina Panthers worth $7 million. He was born to Michael Jerome Williams Sr. and Denise Oher on 28 May 1986. He and his 11 brothers and sisters received little to no support from their parents and lived in foster homes because their father was frequently in prison due to the involvement in criminal activities and mother was a chronic cocaine addict and an excessive consumer of alcohol. They were deprived of parental care, love, and affection while growing up. Michael got a turning point in his life after he was adopted by Sean and Leigh Anne Tuohy when he was 16. 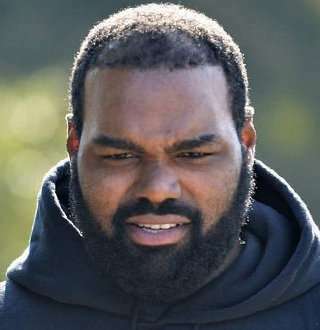 The Tuohys became Oher's legal guardians when he was 17. They provided him with proper care and attention. Michael started getting success in his life because of his second parents who helped him transform from a nomadic lost teen into a force in the football field. With the love and support, Michael, recieved from his new family, he started to excel in football; he quickly became a top football prospect in the state of Tennessee. He got multiple scholarships offers from Division 1 schools. In life, there is not always a success but more difficulties and challenges. On July 20, 2017, Michael was released by the Panthers after a failed physical. He is not known as a man who quits but the man who struggles and gets success. As of today, he works as a free agent and is trying to piece back his broken life. Everyone Thought This Was Michael Oher Wife Picture, Married Or Girlfriend? If we type "Micheal Oher's wife" into Google, it will prompt us to autofill with Michael Oher wife, Tabitha Soren. However, Tabitha is not Michael Oher's wife. The search engine giant extracted the false result because of its SEO metrics that are based on relevancy. Actually, former MTV host Tabitha is the wife of American financial journalist, Michael Lewis, who is the author of the 2006 book, The Blind Side, which is about the evolution of American football. The book has covered about Michael Oher's rise to fame during his final year of high school. The film by the same name, focused on the story of Micheal Oher, was also released in 2009. The film went on to win an Academy Award in the same year. Talking about Micheal Oher actual relationship status, he likes to keep his personal life private. However, because of one infamous incident in 2018, his relationship status might have been revealed. In July 2017, Micheal allegedly attacked a uber driver while he was drunk. According to the driver named Girma Berkessa, Micheal had asked him to follow the car in which his wife was seated and later attacked him when he told Micheal that the car they were following was missing its direction. Michael reportedly believed that the driver was trying to scam him to charge more money and confronted him. Ashley Harlan, Ben Roethlisberger Wife Goes Missing, Where’s She Today? Tanner Foust Obscure Wife & Gay Rumors, Has A Daughter - With Whom?